The government’s bid to avoid a Commons defeat on the Brexit bill has been rejected as “slap in the face” by leading rebel Dominic Grieve. Theresa May assured Mr Grieve ahead of a vote on Tuesday that his call for MPs to be given a greater say on a Brexit deal would be taken on board. But he said ministers had changed the wording of an amendment drawn up after talks with him, at the last minute. Further talks are expected ahead of the bill returning to Parliament next week. Solicitor General Robert Buckland said the government had to “strike a balance” between rebels’ concerns and protecting the government’s negotiating position in Brexit talks with the EU. BBC political editor Laura Kuenssberg said Remain-leaning Tory MPs were furious and it set the scene for another big showdown when the bill returns to Parliament. Why are Brexit rebels upset? Mr Grieve, a former attorney general, told BBC One’s Question Time he could not understand why the government amendment to the EU Withdrawal Bill had been changed “at the last minute” after two days of talks. “I’d actually got on a train. I thought it was all over,” he said. He said the problem was that if the UK reached “the really apocalyptic moment” where no Brexit deal had been done by early February 2019, Parliament was not being offered the chance to say what should happen next – only to “note” the position. He added that rebels would “talk further to the government and try to resolve it”. Another pro-EU Tory MP, Stephen Hammond, suggested the amendment had been “hijacked” by government figures trying to “force their will” onto the process. Asked if ministers had caved into the demands of Brexiteers and changed the wording, Solicitor General Robert Buckland said: “No, I’m not getting into some Tory psychodrama about this. “Colleagues had their say and had an input into the process. No deals were done this was all a process that took several hours, to say the least, to try to produce something that could command support and I’m sorry that some colleagues feel that it doesn’t go as far as they had hoped for, I really am. The bill will now returns to the House of Lords early next week, with both the government amendment and Mr Grieve’s original amendment expected to be debated. It will then return to the Commons, where a fresh showdown is expected unless a deal is hammered out. The government’s amendment to the EU (Withdrawal) Bill sets out what must happen in the event of three scenarios: If MPs vote down the UK-EU Brexit deal, if Theresa May announces before 21 January 2019 that no deal has been reached, or if 21st January passes with no deal being struck. Under these circumstances, a minister must make a statement in Parliament setting out their next steps and give MPs an opportunity to vote. However, the vote would be on “a motion in neutral terms”, merely stating that the House has considered the statement. 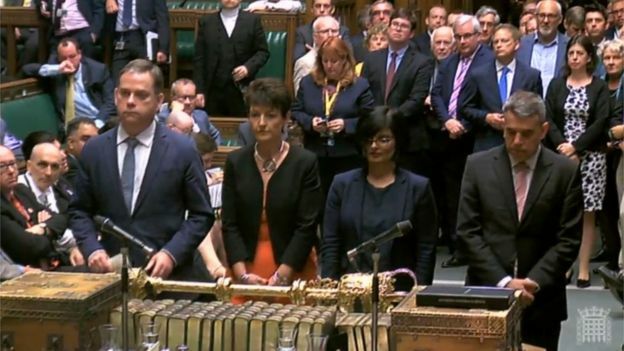 Mr Grieve had originally wanted the amendment to say that the government must seek the approval of Parliament for its course of action – and that ministers must be directed by MPs and peers. Shadow Brexit Secretary Sir Keir Starmer said: “The government’s amendment is simply not good enough. Former Attorney General Dominic Grieve, Anna Soubry and perhaps a dozen of their Conservative backbench colleagues are leading the fight to ensure the Commons has the chance to shape the government’s next move, if no deal is reached with the EU. That is Labour’s view too. But the government is emphatic Parliament should not have that power. Why? Because that would effectively neuter the UK government’s threat to the EU, that it is prepared to walk out without a deal. That’s why Brexiteers are so enraged by this row. And it’s why Dominic Grieve and his parliamentary posse are steeled for a drawn-out fight with their own government. The argument moves back to the Lords on Monday before a likely final showdown in the Commons next Wednesday. A compromise may be brokered before then. But a Conservative source told me the bitterness within the party was now worse than it was during the Maastricht saga in the early 1990s – of which today’s battle over Brexit is, perhaps, the final act. The UK is due to leave the EU in March 2019, and negotiations have been taking place on the terms of the separation and how the two sides will work together in the future. The government is trying to pass a new law, called the EU Withdrawal Bill, which it says is needed to ensure a “smooth and orderly Brexit”. Its main purposes are to end the supremacy of EU law in the UK, and transfer existing EU law into UK law so the same rules and regulations apply on the day after Brexit. But as it passes through Parliament, MPs and peers have been trying to change it, in some cases adding bits on that would change the government’s Brexit strategy.